sesame seeds, sunflower seeds etc. Put the dried yeast in the bowl with the liquid which should be 35-40 degrees celsius. Add the oatmeals and stir. Cover the bowl completely with a tea towel/plastic bag and let it rise for 20 min in a warm place. When the dough is bubbling, you can add the remaining ingredients and knead for about 1 minute until the dough gets a soft texture. It´s going to be a little sticky, don´t add flour. Bake the dough straight away into buns and then cover the buns and let them rise for 10-20 min. After 20 minutes have passed, or when the buns have doubled in size we need to prepare them before baking. 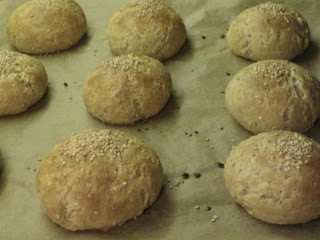 Using a brush, generously coat each of the buns with the egg wash/water or milk. Then sprinkle over the sesame seeds/sunflower seeds etc. Place the baking tray in the centre of the oven and bake the buns for 10-12 minutes.